Garden of Aaron: New Growth in the Sedum Patch! 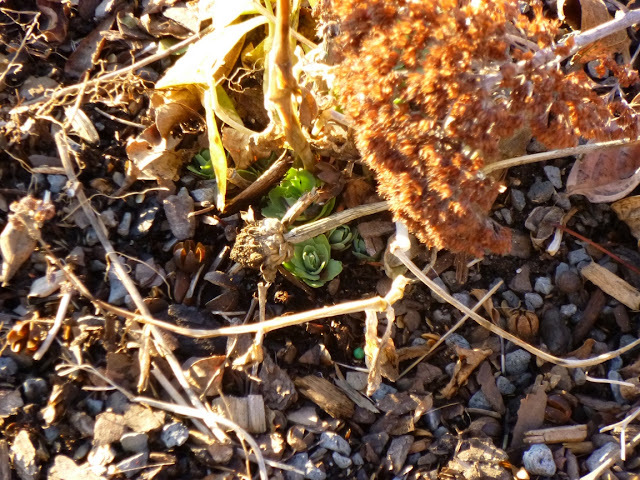 Autumn Joy sedum in January. From a distance, it seems dead and dormant. But look closely at the base of the plant. Do you see a hint of greenery? Yes, even in the dark and cold days of January, when the Christmas lights have come down and the days are still too short for my tastes, it is possible to find hopeful signs of spring lurking in the undergrowth. When it's not too cold, I like to walk around my garden, checking to see how leaves and dead plant matter are decomposing and adding organic material to the soil. The Autumn Joy sedum that I left standing for "winter interest" has pretty much toppled. It's my first year growing this sedum, and I was wondering if/when I should cut it back and perhaps toss the cut parts somewhere less conspicuous to decompose. 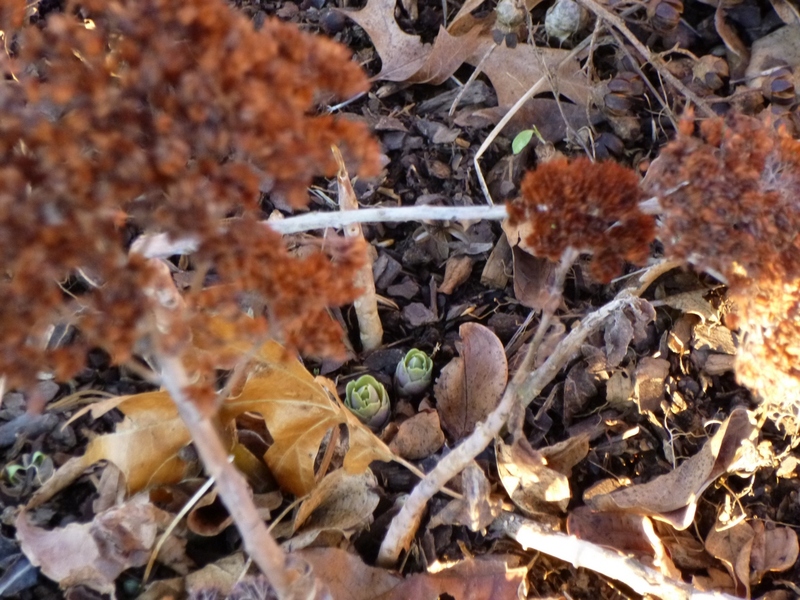 As I leaned into look closer, I spied it - fresh new green rosettes, tightly curled, just starting to poke through the soil. What a hopeful sign of Spring to come! The sight filled me with joy and wonder. 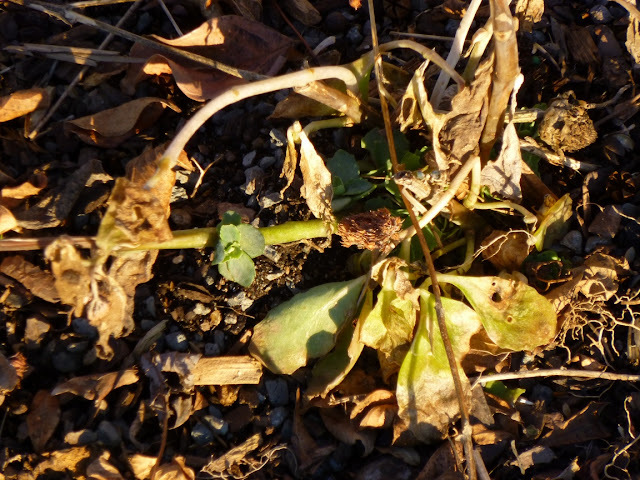 At first I only saw a couple new rosettes among the collapsed and decaying leaves of last year's growth. But then I shifted my angle and saw many more new rosettes forming at the soil line. And it looks like some new growth on the lower part of one of the older stems? Should I cut above the new growth when I trim back the plant? I like the way that gardening encourages us to look more closely. Is there anything you noticed recently in your garden that caused you to take a second look? Two more proud little sedum shoots peeking up through the soil. I have to admit I wasn't overly impressed with the sedums I planted last year, but they're off to a great start this spring and maybe will do better in 2013 now that they have settled in and have a chance to engage in a full year of growth? I feel like the perennial garden will be waking up shortly and soon it will be time to sow annuals. You can follow the action with email updates. After reading your post I went out to look at my sedum. Sure enough it has new growth too!! How exciting! I also noticed that my early daffodils have buds on them and the ones I planted in Fall are poking their heads up through the soil. Spring will be here before we know it! Thanks Christy! I wonder if the warm weather this wknd (forecast to be around 70!) will prompt a flush of growth. I'm sure winter's not over yet, so I just hope that nothing tender gets frozen later on (though it probably will). My sedums are like the energizer bunny. They keep coming back year after year and are real hardy. I usually don't cut them back till late winter /early spring. I have read that out west in the dessert area like Las Vegas they can become several feet tall. I have even taken some cuttings in the summer when they bolt to quickly and start new plants. The only negative thing I have experienced is that when they flower in early fall and start to turn that reddish hue, the flies are attracted to them. That is why I don't plant them near the house so flies don't come in the house. PS- The other day after we chatted about pine straw, my aunt came by and left me 3 big bags of pine straw. What kinds of sedum do you have? Didn't notice any flies on the dried flowers last year, but I'll keep an eye on it this year. I did notice the occasional butterfly on the sedum last year, but not as many as I had hoped. I think you sometimes need a critical mass of a certain kind of flower to attract pollinators. Hopefully I'll have more sedum this year = more butterflies! Hmmmm.... The pine straw usually will weave with each other to prevent it from blowing away or if there is a lot of water. I always have mine at least 3-4 inches thick to prevent weeds coming up. Another thing that I practice and really helps with keeping the weeds out is saving all cardboard to reuse by layering the cardboard around my plants, then putting a layer of pine straw on top of that. It not only keeps the moisture in, but also breaks down and improves the clay soil. Worms love them because on real hot days they will gravitate to a cooler place and also help with breaking down the cardboard. From cereal boxes, to pasta boxes... Anything that you buy at the grocery store that is in cardboard can be used. I don't use any weed fabric at all. You won't believe the amount of stuff you would normally throw away that can be used for either a weed barrier or to use in the compost pile. I like to let it sit out in the rain and get seasoned, so when you lay it down in your beds, it is soft and will lay flat. Just make sure you take any plastic tape or those plastic window films off before you use them. Anyway.... That is my garden rant for the day. I know off topic but I thought this may help a hit. Aaron we just had a thaw so I had a chance to see some new growth and a soupy mess...but we are due for freezing temps and more snow so our winter is still here for a couple of months. Hang in there, Donna. I think winter is for the garden like sleep is for us - a chance to recuperate, rest and recharge -- and get ready for an exciting growing season ahead! Aaron.... You asked what sedum I had. It is autumn joy. Mine too. Plus Autumn Fire, I believe. Oh yes, the Sedum rosettes are amazing, aren't they? I noticed some poking up in early December before we had our big two-foot snowfall. I even noticed a Hyacinth about an inch high--but some pesky animal was chewing on it! Since then, everything has been covered by snow--which is good because it's supposed to get really cold next week (teens for highs!). Thanks for reminding us that spring isn't far off now! Nothing seems to eat the sedums. At least that's what I thought. I noticed one of the old stems is gone today, but perhaps it just snapped off in some of the high winds we've been having? Spring seemed closer last week. Now everything is covered by ice. We're supposed to warm up a little this wknd and then dive back into colder weather next week. That's OK - this is wintertime! I love the tiny rosettes on the sedum. Nice thing about Autumn Joy and other sedum-- they root so easily, which is good when the dogs run through the garden. I tried rooting some cuttings of sedum in the garden late last year, but I think I got them started too late in the fall. When is your favorite time to divide or transplant your sedum? PS - And do you have any favorite sedums beyond Autumn Joy? Aaron, there is a variety in the Autumn Joy family called 'Neon' that has bright hot pink flowers. I had that one -- in many places after the dog ran through the garden to get his ball. As for the best time? if you really plant the stems instead of just letting them sit on the ground, I would recommend letting the cut end harden off first. Make sure the soil stays moist until the roots take hold. Sorry Janet. Not sure I completely understand what you mean by "letting the cut end harden off first". Do you suggest cutting, letting the cut part sit on the ground until the cut end hardens and *then* planting in the ground?? That seems counter-intuitive to me. Or am I completely misunderstanding you? PS - And if your dog was able to 'propagate' Autumn Joy just by running through the garden, would it perhaps make sense just to cut off some pieces from a patch - say in springtime, when the weather is wet, and just scatter here and there in the garden on the surface in the hopes that they'll root? Sounds like they are *very* prone to rooting easily! Yes, if you are going to plant it, let the cut end form a cuticle, that way it doesn't get mushy when you put it into the ground. 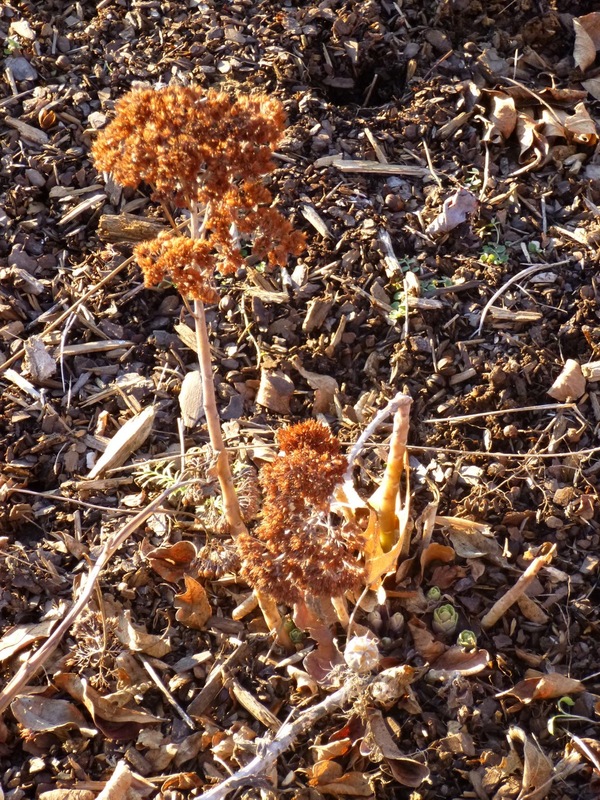 When the dogs run (ran) through the sedum, the stems would lay on the top of the ground and roots would come out along the stem and then you would have a newly rooted plant. I guess you could sort of form a mini trench and lay the stem in the trench, giving more area of soil contact. To me sedum is the easiest plant to propagate. Brilliant. Thanks Janet! I appreciate all the advice. One last question -- When your dog ran through the sedum patch and the resulting damage actually resulted in propagation -- was that Spring, Summer, Fall? Or did it not matter? It did not matter. The ball fetching dog fetches all day, every day. Sounds like he's a sedum-propagating machine!! LOL! :) Thanks Janet. Have a great day.